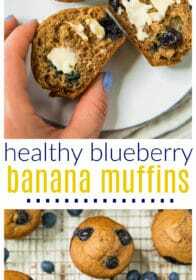 Simple to make and family friendly, these Healthy Blueberry Banana Muffins are moist, sweet and quickly becoming a breakfast staple in my household. 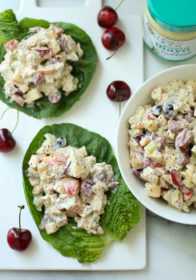 Give them a try for yourself – I promise you’re going to want to make them again and again! 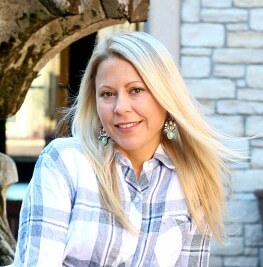 Muffins and quick bread recipes are some of my favorites to play experiment with. 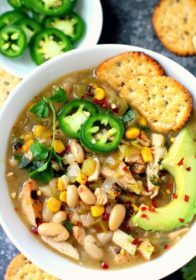 They are so adaptable and it’s easier than you might think to make them lower in calories and fat. 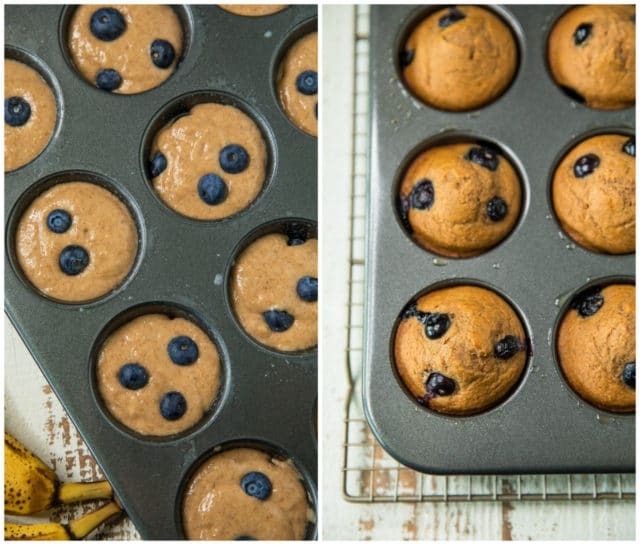 Since the banana naturally adds sweetness and moisture, you can hardly tell that these muffins have been made healthier. 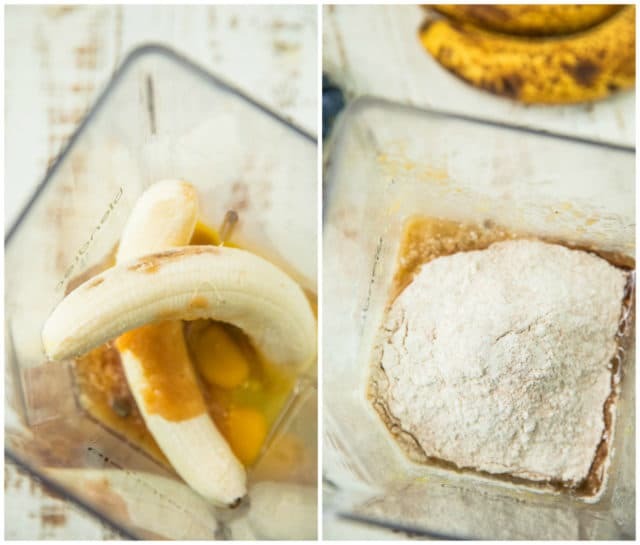 Banana is my favorite ingredient in healthier baking recipes! Using bananas in bread recipes allows for a great reduction in fat and sugar. When making most baked goods, I also like to replace a portion of all-purpose flour for whole wheat or spelt flour. 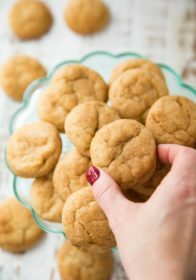 You can also choose to use all whole wheat flour, but your recipe will taste nuttier and be a bit more dense. 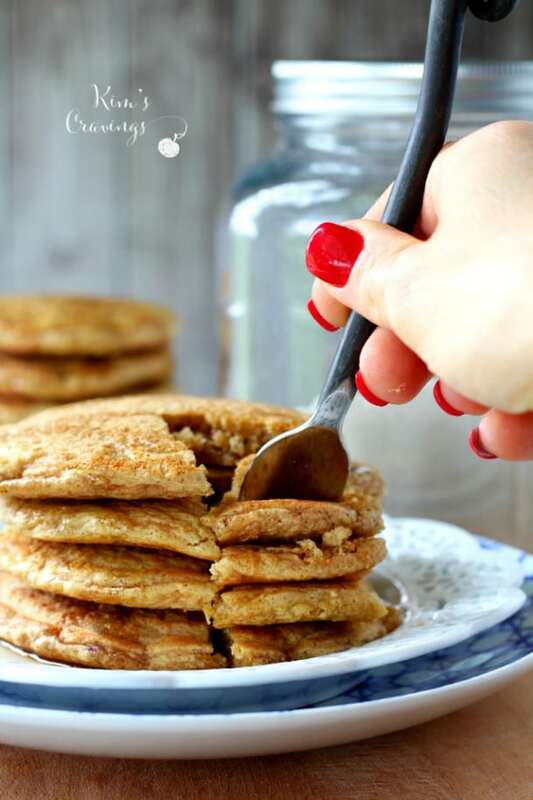 White whole wheat flour is also a great option. Because of those wonderful bananas, we’re able to reduce sugar and fat. I’m only using 1/4 cup of honey for my sweetener; where most muffin recipes use 1/2 to 1 cup of white or brown sugar. 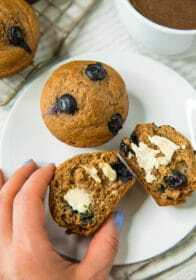 You can use another sugar substitute in this recipe, if you prefer, but I love the honey flavor it gives these muffins. For the fat, just 1/4 cup melted coconut oil (olive oil works, too). 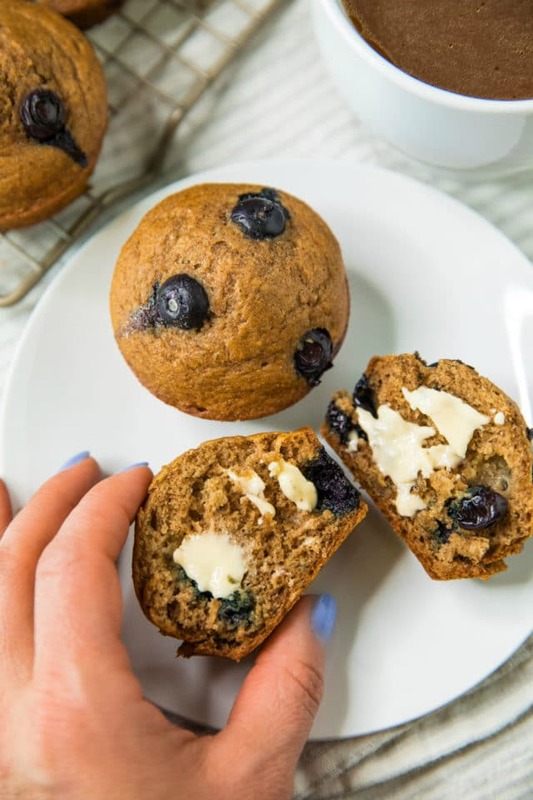 With the addition of applesauce, you won’t need very much oil to make for a super moist, delicious blueberry muffin. Whole grain baked goods can come out fairly dense. I have found that the biggest thing that helps avoid this is to not over-mix the batter. When you hear cooks on TV saying “stir until just combined,” they mean it. The more you mix, the denser it will be. So when you add the flour and oats to the wet ingredients, make sure you only just combine it, and then gently fold the blueberries into the batter. Over-ripe bananas are awesome! Please, please, whenever you have bananas about to go bad, don’t throw them out! Peel them and put them in a baggie in your freezer until you want to use them for muffins, bread, or waffles. When you need them, take them out of the freezer and let them sit out for a bit or microwave them for about 45 seconds. While we are on the subject of freezers, these muffins can be frozen for up to 6 months in an airtight container or bag. 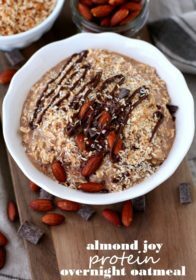 When you want one, simply remove from the freezer and microwave for 30 seconds to one minute for a quick and easy breakfast. 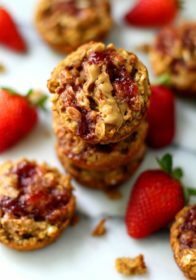 Looking for other favorite muffin recipes? Try these! 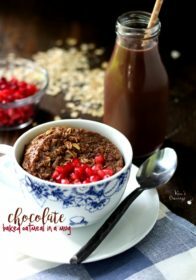 Easy, delicious and made healthier - the perfect breakfast treat! Preheat oven to 425 degrees F. Prepare a muffin pan with cooking spray, if needed. In a large mixing bowl, combine mashed bananas (I mashed mine in my blender) with applesauce, eggs, honey and oil. Stir vigorously until the mixture is smooth. In a separate bowl, combine the dry ingredients- flour, cinnamon, baking soda, baking powder and salt. For best results, spoon flour into cup (rather than scooping with cup) and then level using a butter knife. Make a well in the center of the flour mixture and add wet ingredients. Gently stir until just combined. Don't overmix. Spoon batter into the prepared muffin tins filling each one completely full. Bake muffins for 5 minutes at 425 degrees F. and then with muffins staying in the oven, reduce heat to 350 degrees F. and bake muffins for 13-15 minutes more. The high heat will cause muffins to rise and then you will lower heat to cook the center of the muffin. Remove from oven and allow to cool in the pan for 10 minutes before transferring to a wire rack to cool completely. You might need to run a butter knife along the outer edge of the muffins to loosen them from the pan. Feel free to use any combo of flour that you prefer. You can use all all-purpose flour or all whole wheat. Do not use cupcake liners, muffins will stick to liners. STORAGE: These muffins will keep at room temperature for up to 2 days, or in the refrigerator for up to 4 days. They keep well in the freezer in a freezer-safe bag for up to 6 months (just defrost individual muffins as needed). CHANGE IT UP: Feel free to add in other favorites. Fold in up to ¾ cup chocolate chips or chopped nuts. You can also swap out the blueberries for raspberries or chopped strawberries. 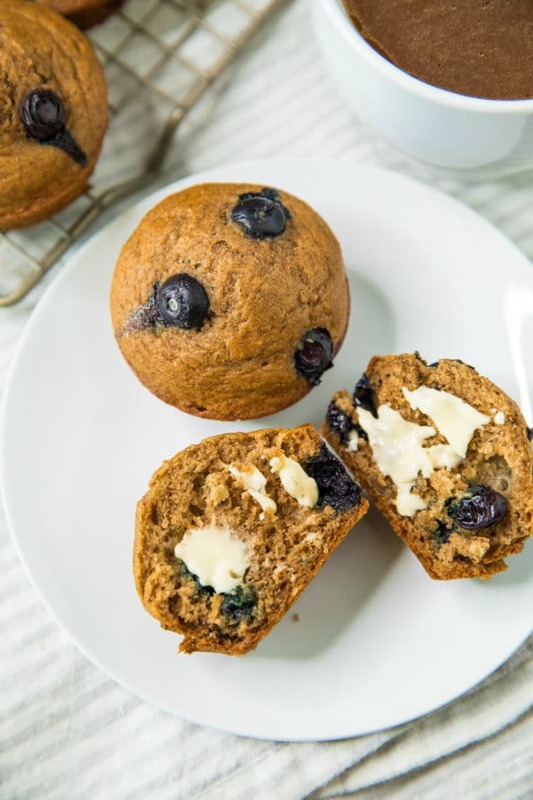 SERVING SUGGESTIONS: These muffins are great on their own, with a pat of butter, or spread with almond butter or jam. MAKE IT GLUTEN FREE: Bob’s Red Mill gluten-free all-purpose flour blend works well. Dear Kim, These look wonderful…I love a good muffin in the morning with my coffee. I also love the idea that these can easily be made in the blender. Going to have to try them soon! Are these not the cutest muffins ever! I love that you “healthified” them and yes they still looks so delicious! My kids would love these! We make a lot of muffins in our house and sadly I can’t have bananas, but my kids can and love them. 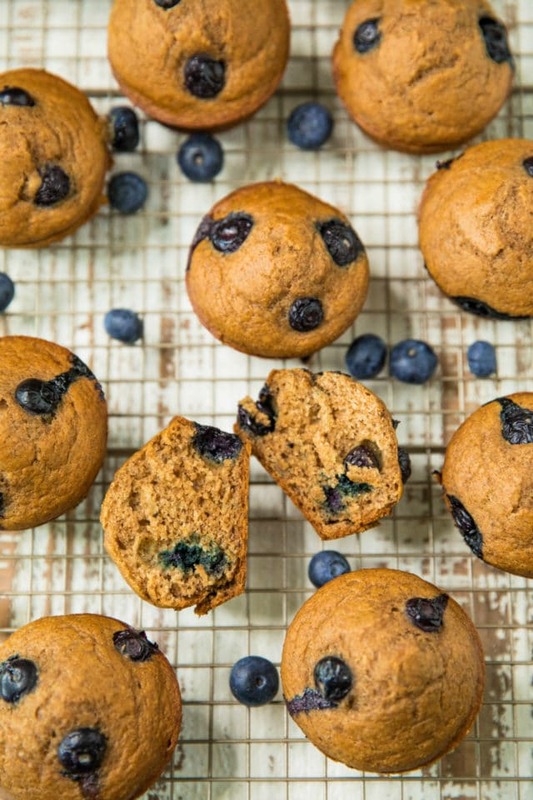 What a great way to make a healthier blueberry muffin! Love these! I added a little ground flax seed and chopped walnuts to them and cut back on the cinnamon. Yum! Awesome! I’m so glad and I love the addition of chopped walnuts!